Four investigators have found an innovative way to restrain raccoons which is very humane. A one year study, conducted in Illinois, compared the "traditional leg hold trap" with the new EGG trap for the nature and magnitude of injuries sustained in each trap. 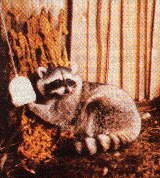 In 1992, 86% of the traps set for raccoons were leg hold or foot hold traps. Regardless of the type, raccoons have a tendency to chew trapped toes and feet. 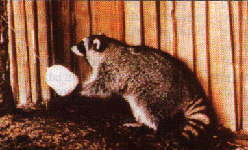 The new trap restrains the captured animal's front foot (hand) in a plastic device which hangs above ground, the raccoon puts his hand in to explore the contents of the domed plastic trap, and cannot remove it, there is no pain or pressure applied. The captured animal sits quietly. The performance of the new trap was "vastly superior" to the old trap, and is much more humane in situations where traps need to be used. The development of this new trap was sponsored by the American Veterinary Medical Association. The USDA has granted a conditional license for a rabies vaccine for raccoons. The vaccine, known as V-RG (vaccinia-rabies glycoprotein), is administered orally by placing in bait specially designed to attract raccoons. The vaccine was developed by scientists at Philadelphia's Wistar Institute, in collaboration with colleagues at the French company Transgene. The vaccine is manufactured in the US by Rhone Merieux. The vaccine can only be used in state or federal rabies control programs and is not approved for use in individual animals. Raccoons are one of the leading carriers of rabies in the Northeastern US and have been a major factor in the increase of confirmed cases of rabies in both humans and animals. In 1993, there were 9,495 confirmed cases of rabies in animals, largely due to the explosion of the disease in raccoons. In Europe, the vaccine has been used successfully to control rabies in red foxes and is currently being used in Canada for red foxes and in Southwestern US for coyotes. The vaccine is safe and the fact that it is oral hopefully will make it successful as a rabies control in raccoons.